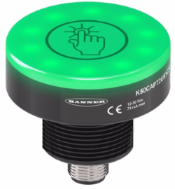 Previously available in domed models, Banner's next generation K50 touch buttons are now also available in a compact version with a flat touch surface. The K50 Compact Touch Button is easily actuated with the touch of a finger, hand, or whole palm, requiring no physical pressure to operate. The low-profile design is ideal for panels, cabinets, and other space deployments. LED lights are concentrated closer to the window than domed models, making the indication brighter when viewed directly. This allows for improved visibility in very bright conditions. The K50 Compact models offer Smart Electric Field Sensing technology, providing Gen 2 touch buttons with excellent immunity to false triggering caused by the buildup of detergents, oils, and other foreign materials, as well as exposure to direct water spray.